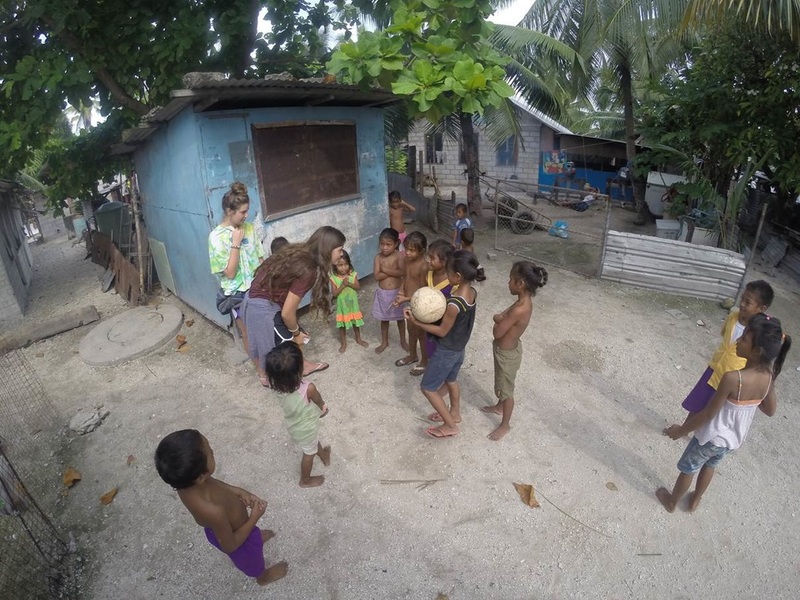 The mission of Goals for Good Foundation is to foster mutual awareness, appreciation, and understanding between the peoples of Pacific island nations (especially Kiribati) and the US. Our purpose is to promote international understanding and friendly relations between our nations. - Shared history, linkages, and common destiny. We seek to raise mutual awareness and respect. This web page is one means by which we achieve that goal. - Kicks﻿﻿ for Kiribati. During our recent visit, we were struck by the love that many children have for football (soccer to us! ), although in many cases, they lacked even basic supplies. Yet, physical inactivity in Kiribati can lead to health issues. The goal of this project is to raise funds and donations for collecting and shipping supplies for the kids of the islands to have balls, pennys, cleats, and cones for goals. - Scholarships for Students. As discussed elsewhere, education is a key component of the nation's "migration with dignity" program. Kiribati is an ﻿economically challenged nation﻿, and many families cannot afford for their children to attend high school. A long-term goal is to raise funds sufficient to establish scholarships for kids. - Spread the word! An important part of our mission is simply informing Americans about the issues facing Kiribati. Simply sharing our website links about Kiribati would help immensely! - Provide new or gently used soccer equipment. We welcome donations of gently-used or new soccer equipment. Once we have enough, we will ship it to our contacts in Kiribati for distribution. See the "Contact Us" page for more information, or send an email to goalsforgood-at-gmail.com. - Donate funds. We have 501(c)(3) tax-exempt status in the United States. We welcome donations - please use the button below for donating through PayPal, or send a check to the address on the "Contact Us" page. We are privileged to work with individuals and groups in Kiribati, including the Kiribati Children Campaigner's Network (KCCN), founded by 50 active, talented, and dedicated young community members on Tarawa. Check out the KCCN web page!